Randy Wheeless of Durham, North Carolina writes an inspiring story for USCF online concerning chess in Namibia. At the 2006 Olympiad, Namibia carried two teams so chess certainly has a home in this tourist's paradise. However, Will Garneau, a Peace Corps volunteer, fired off an e-mail to Wheeless requesting chess materials for a school in Otjituuo, Namibia. Wheeless thinking it was an e-mail scam hovered his finger over the "delete" button before he recognized that Garneau was once a fellow chessplayer in Durham. Wheeless made a request for 10 chess sets which were delivered. It's amazing how small gestures receive the biggest responses. The article included many nice pictures showing the students opening the box in great anticipation and the joy that followed. These are the types of gestures that should be seen more often since chess equipment is very difficult to obtain due to lack of funds and lack of distributors. Most chess players in Africa are left with the options of purchasing materials when (and if) they travel to an international tournament, or to pay expensive postage and hope they receive the goods. In this case, the story ended on a positive note and hopefully those sets will come into good use. 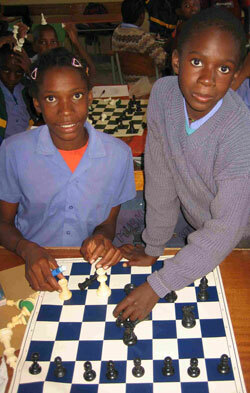 Two students in Otjituuo, Namibia graciously receive their new chess sets from North Carolina, USA.